By the twentieth-century photography lecture, students will likely have already engaged in visual analysis of art works, so that beginning class with a close formal analysis of a single photograph provides an opportunity to review these skills. For example, Alfred Stieglitz’s The Steerage is a complex but highly structured photograph. Students might begin by spending two or three minutes quickly drawing the basic lines, shapes, and forms of the composition in order to understand its careful geometry before proceeding to a class-wide analysis and discussion. Students might be asked, “Why do you think Stieglitz framed the subject in this way?” The Steerage can be used to introduce how the camera’s framing changes our perception of reality. Dorothea Lange, Migrant Mother, Nipomo, California, 1936, Gelatin silver print. Background reading might include the survey textbook, a selection of thematic essays from the Metropolitan Museum of Art’s Timeline of Art History, and the Smarthistory essay on twentieth-century photography. Video resources include the BBC series The Genius of Photography, a great resource from which clips could be viewed in class. The Getty’s video on Dorothea Lange’s Documentary Photographs (also suggested by Smarthistory) might be a good conversation starter for this lesson, which is focused primarily on documentary photography. This lesson plan focuses on a key aspect of the history of photography: how twentieth-century photographers balanced the camera’s capacity for documentation with its aesthetic possibilities in order to convey a variety of social and cultural messages. The concept of socially engaged documentary photography can be introduced through the early efforts of Jacob Riis and Lewis Hine to depict and publicize the living conditions of immigrants in New York’s slums and child workers in factories throughout the East Coast. Riis, himself an immigrant from Denmark, went into the poverty-stricken tenements of the Lower East Side to create his stark photographs. Using flash powder, Riis literally and metaphorically shed light on the squalor in which many lived, and his photographs were used to promote reform. He published the images in How the Other Half Lives (1890). Hine, who began his career as a sociologist and teacher, began photographing the plight of New York’s immigrants at Ellis Island in 1908. Working for the National Child Labor Committee, Hine traveled throughout the East Coast documenting the bleak reality faced by child workers in factories, mills, and agriculture. Hine’s photographs were presented in pamphlets, posters, and slide shows in an effort to gain public support for regulation and reform. Through Riis and Hine’s straight approach, the photograph carries the weight of objective fact, laying bare the daily realities of these children’s lives for an audience of middle-class Americans. At roughly the same time, Pictorialist photographers like Edward Steichen and Alfred Stieglitz were striving for photography to attain the status of art, consciously turning their cameras away from subjects depicting modern industry deemed unworthy of the fine arts. Both Steichen and Stieglitz were German immigrants who had trained at art academies in Europe, and they incorporated conventions and techniques of painting and printmaking into their photographs. How does Steichen’s photograph convey his artistic identity? Here, he shows himself not with a camera, but with a paintbrush, in a manner reminiscent of centuries of painters’ self-portraits like those of Rembrandt. He also manipulated the final image using the gum bichromate printing process and applying retouches with a paintbrush, thus giving the mechanical photograph a hand-crafted quality. In a comparison of two photographs of the Flatiron building by Steiglitz and Steichen, how are the techniques of Pictorialism combined with an interest in formal elements? In Alfred Stieglitz’s photograph, we see less manipulation of the print, and more emphasis on the underlying structure of the composition. The subject is ostensibly a modern skyscraper—rather than a still life, portrait, or traditional landscape—but Stieglitz focuses the viewer’s attention foremost on the formal relationship of the photograph’s pictorial elements. Stieglitz saw his photograph The Steerage as a breakthrough moment in which formal elements of the composition took precedence over manipulation in printing. His interest in formalism belies the social relations at play here: we see the wealthy passengers separated by the stark horizontal gangplank from the second-class passengers who are literally “beneath” them. Notably, Stieglitz—also an important New York City gallery owner—was instrumental in bringing (non-photographic) formalism to America through shows of prominent European painters and sculptors. The question of formalism’s capacity to convey a social message despite its emphasis on composition became a subject of debate in the political context of Revolutionary Russia where Laszlo Moholy-Nagy’s New Vision photographs were first viewed as empty distortions of reality. While Moholy-Nagy took up photography at the Bauhaus as just one medium among many with which to experiment, Alexander Rodchenko’s striking compositions were intended to shock the viewer into new relationships with reality, forcing her out of complacency and toward political engagement. Do you see a difference? Moholy-Nagy lived and worked outside the USSR, where he did not face the same obligation toward social and political engagement as Rodchenko. Moholy-Nagy was ultimately freer to experiment with abstraction and form. Consider how Moholy-Nagy’s photographs exalt modern architecture and technology, and turn them into abstractions, and how Rodchenko’s focus on people engaged in activities like gathering for a political demonstration or staying current with the news. In the United States in the 1930s, American photographers were employed by the United States Government. During the Great Depression, the Farm Security Administration (FSA) sent photographers all over the U. S. documenting the conditions of urban and rural workers, and especially the public programs that were helping people find employment. 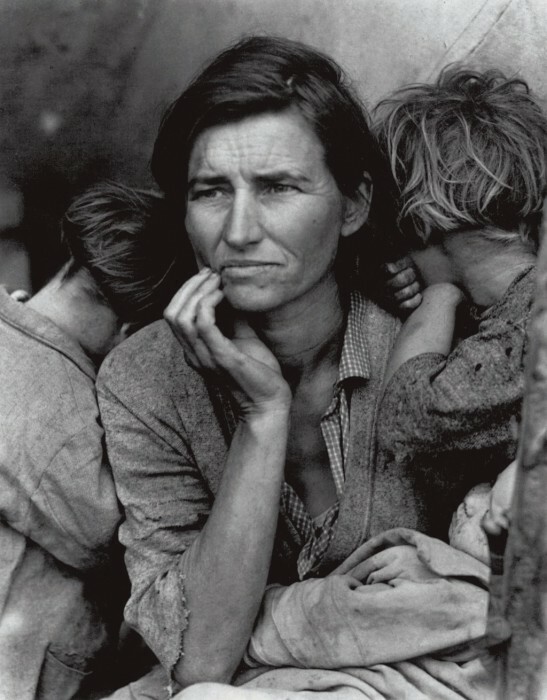 Dorothea Lange’s Migrant Mother has become an iconic example of this period. What makes this photograph iconic? How does it relate to other images we’ve seen in class? Lange’s photograph was printed in magazines in order to sway middle-class public opinion in favor of Franklin Delano Roosevelt’s social programs. Magazines like LIFE proliferated in this period, employing photographers trained in New Vision and documentary photography as photojournalists. Walker Evans also worked for the FSA, but quit the program after disagreements about the use of his photographs. He published an influential book of his documentary photographs in 1941 called Let Us Now Praise Famous Men. In the twentieth century, magazines and books became important platforms in which photographs were viewed in sequence and alongside text in the form of stories, captions, and even advertisements. These interrelationships of word and image continue to play a powerful role in how (or, if) photographs convey a social message. Robert Frank, a Swiss photographer who won a Guggenheim fellowship in 1955 to travel across the U. S. documenting everyday life, also published his photos as a book. Influenced by Let Us Now Praise Famous Men, his book The Americans was first published in France and then in the U. S. with an introduction by the Beat writer Jack Kerouac. The Americans was criticized by the magazine Popular Photography for portraying a negative vision of life in the U. S. Within the context of Cold War nationalism, Frank’s sometimes biting perspective on contemporary American society was viewed as anti-American. Frank utilized the straightforward approach of documentary with a careful eye for framing contrasts and incidental moments. What do you think, are these negative depictions of America, or do they simply reveal the truth? Lee Friedlander was one of a generation of photographers working after Frank in the 1960s who also framed incidental and contradictory moments in photographs in witty juxtapositions reminiscent of collage. These photographers became known as the New Documents after they were given an exhibition by that name at MoMA in 1967. This institutional recognition shows how far photography had come to be recognized as an artistic medium by this period. How does Friedlander’s self-portrait reflect this change in attitude through comparison with Steichen’s? Most of those who were called documentary photographers a generation ago, when the label was new, made their pictures in the service of a social cause. It was their aim to show what was wrong with the world, and to persuade their fellows to take action and make it right. In the past decade a new generation of photographers has directed the documentary approach to more personal ends. Their aim has been not to reform life, but to know it. Their work betrays a sympathy—almost an affection—for the imperfections and frailties of society. They like the real world, in spite of its terrors, as the source of all wonder and fascination and value—no less precious for being irrational. Art photography throughout the twentieth century was associated with black-and-white prints, whereas color was reserved primarily for amateur snapshots and advertisements. William Eggleston had a similar wit and cleverness as the New Documents in his approach to the details of everyday life in the American South, incorporating shifts in scale and perspective, but adding tropes of the snapshot—including color. Eggleston’s use of color enhanced his photographs’ capacity to convey the realities of suburban America, more fully revealing the social world depicted by Frank and the New Documents photographers. In the 1960s, artists and photographers also began working conceptually within the by-then-established styles and stereotypes of mass media. Ed Ruscha mimicked the poor quality and banal content of real estate ads in his Every Building on the Sunset Strip, an artist’s book that catalogued typologies of vernacular buildings. A similar project was undertaken by the husband and wife photographers Bernd and Hilla Becher, who traveled through postwar Germany documenting the structures of modern industry with impeccable technical precision. Exhibited in series or grids, these works depend upon close observation and comparison, and undermine the status of the unique photograph to convey information. Between 1977 and 1980, Cindy Sherman disguised herself as generic Hollywood female types like the young secretary, the femme fatale, and the ingénue in her series Untitled Film Stills. These photographs provide commentary on how fully we have digested cultural images of femininity. Barbara Kruger complicated these ideas further in her collages. Incorporating the look of advertisements, she addressed the history of the gaze in art, but often left the gender norms ambiguous. Her collage, like Cindy Sherman’s photography, also uses the visual lexicon of mass-media imagery in order to critique the systems that it reproduces, such as sexism and capitalism. Based on their appropriation of mass-produced imagery, these artists and their cohorts have become known as the Pictures Generation. Social critiques like theirs should also be viewed in relationship to the political, social, and intellectual upheavals of the 1960s, including the Civil Rights Movement and student revolutions in Europe. The Feminist Art movement of the 1970s, upon which Sherman and Kruger’s work builds, demonstrates artists’ engagement with identity politics in this period. By the 1980s, photography began to appear on a scale previously reserved only for paintings. In massive, wall-filling color photographs, Andreas Gursky, who trained under the Bechers, was one of many photographers to depict the spaces and commodities of globalization. Incorporating seamless and convincing manipulation, these photographs immerse the viewer in places like shops, hotel lobbies, and airports: generic, brightly lit, spaces of consumerism and transience. The bigger picture: Since the 1960s, photography has become one of many media contemporary artists are likely to use. Because of its “truth value,” it is a potent tool in postmodernism’s investigation of how reality is constructed. How does this notion call into question the tradition of documentary photography? A short writing assignment prompt might be “What makes a photograph iconic?” Ask students to select an “iconic” photograph and to explain in a one-page essay why it has become so. What visual characteristics have contributed to its iconic status? What cultural significance does it hold? Students might also be directed to an assignment from one of the George Eastman House’s Discovery Kits Online, such as that dedicated to FSA photography. Beth Saunders (author) is a PhD Candidate at the CUNY Graduate Center. Jon Mann (editor) is an Adjunct Lecturer at Lehman College, a Senior Contributor at Artsy, and a lecture contributor and editor at Art History Teaching Resources and Art History Pedagogy and Practice.